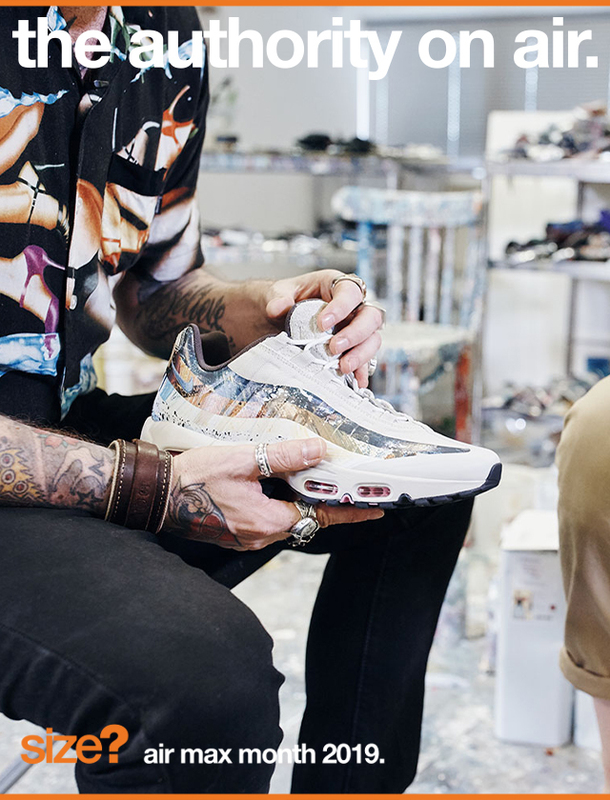 Nike Air Max Day 2019 | Size? Air has been around for some time. 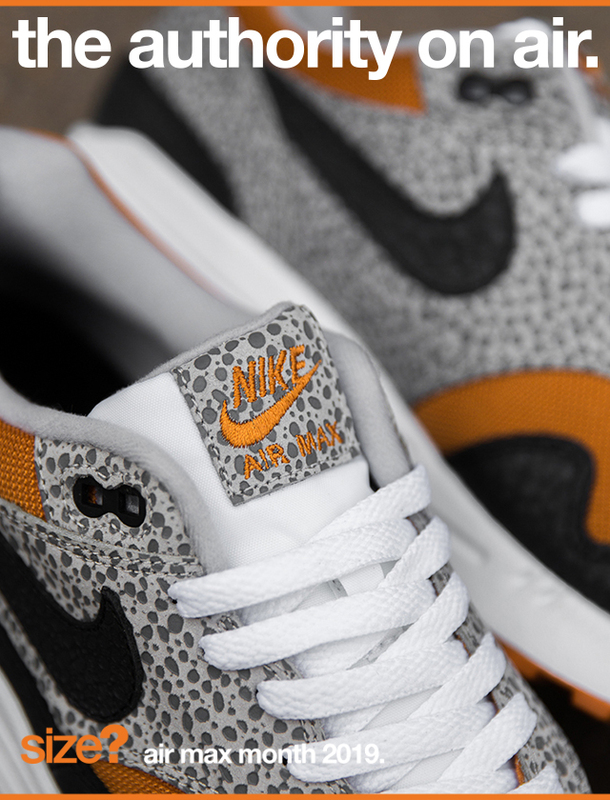 It debuted on the ’78 Nike Tailwind and became visible on the coveted 1987 Air Max 1. Since then, the pioneering midsole has taken many forms, constantly evolving to deliver unprecedented levels of cushioning and support. On the 26th March, Nike honours the game-changing concept with a series of Air-injected, limited-edition silhouettes. There’s iterations of the illustrious Air Max 90, the Air Max 97 and the Air Max 98, as well as exclusive releases of the re-released Air Max Light OG, the Air Max2 Light and the all-new Air Max 720. 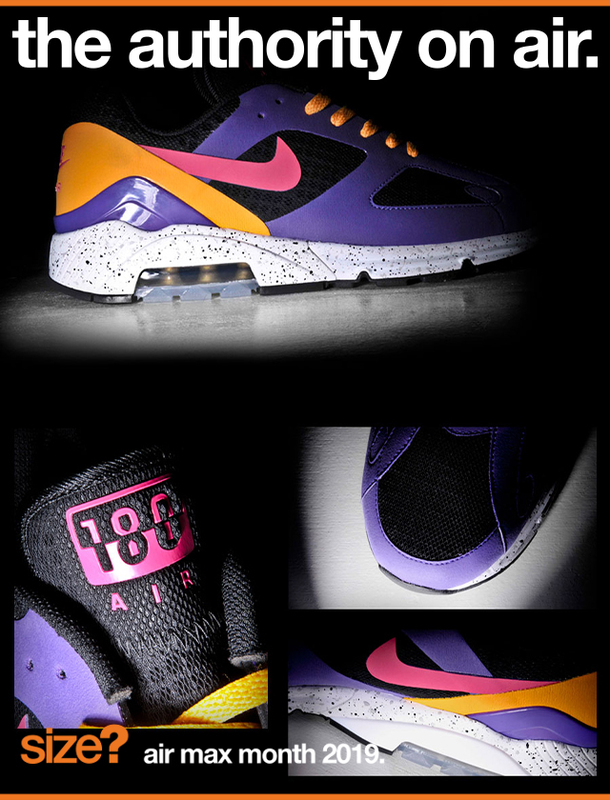 The Air Max Light OG was just Nike’s second runner to boast visible air on its ’89 release. 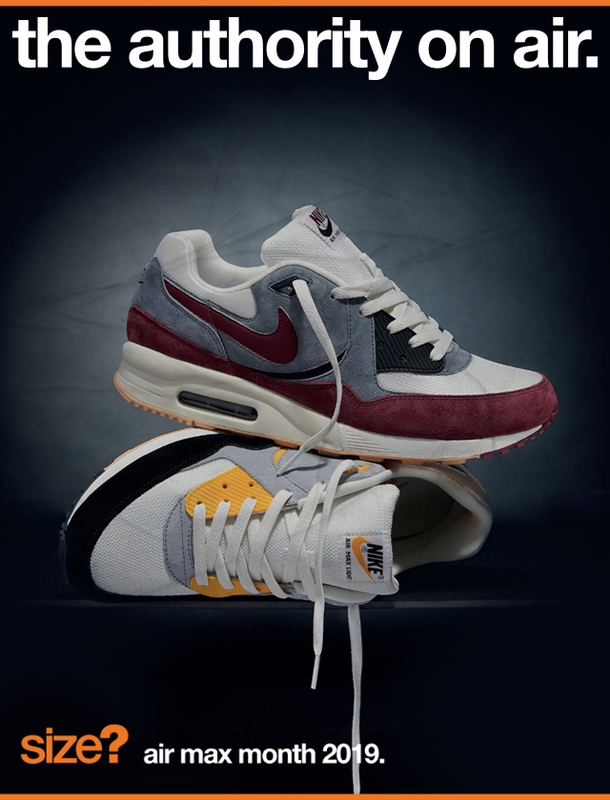 Initially marketed as the Air Max II, the runner was rechristened the Air Max Light due to the construction process of the sole unit, which resulted in a substantial weight difference to that of its predecessor. 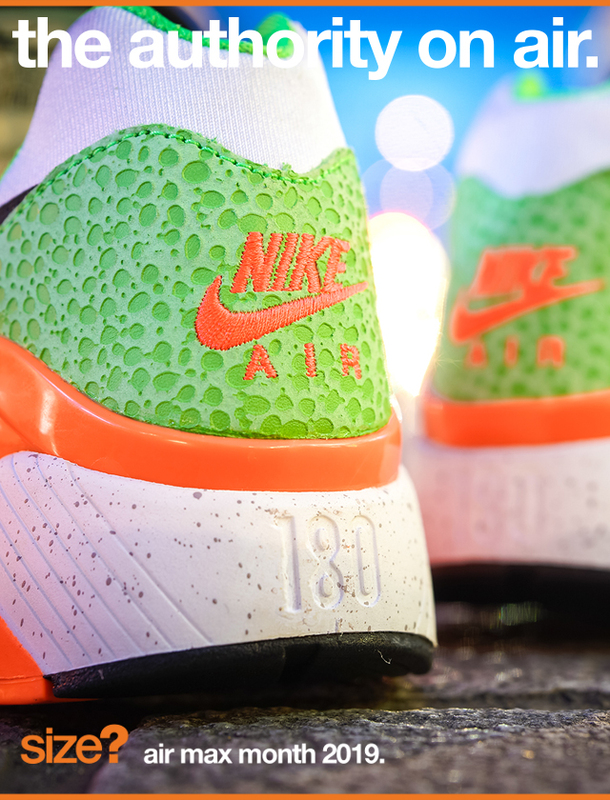 The Air Max 90 strived to provide even more cushioning than its ’87 predecessor. Tinker Hatfield - the architect responsible for visible Air - made this happen by embedding the silhouette with a larger volume of encapsulated Air. The result? Increased comfort. But the shoe also garnered attention for its daring ‘Hyvent Orange’ colourway, with the popular palette going on to inspire a string of highly-coveted ‘Infrared’ releases. Back in 1994, the Air Max2 Light’s innovation of introducing a four-chambered Air unit and two pressure systems underfoot proved to be very popular amongst runners, who reaped the rewards of a supremely lightweight midsole. Shelved for 25 years, the Air Max2 Light finally made its long-awaited return in 2019, re-emerging with its original dual-pressure chamber heel and Air-encapsulated forefoot sole unit. Contrary to popular opinion, the Japanese bullet train isn’t where designer Christian Tessler drew his inspiration. In fact, he was inspired by nature - and perhaps more surprisingly - mountain bikes. The rippling effect of when a raindrop splashes onto a puddle influenced the 97’s wavy upper, while first-of-its-kind 3M taping was inspired by the frames of ‘90s mountain bikes. A flagship silhouette for many reasons: the Air Max 97 was also the first Nike silhouette to boast a full-length visible Air midsole underfoot. Next in the Air Max lineage, the Sergio Lozano-designed Air Max 98. The silhouette retained the 97’s full-length Air midsole; crucially, however, the 98 diverged from its younger sibling’s clean, wavy lines, instead reworking the uppers with added chunkiness and bold panelling. The bona fide ‘90s classic has enjoyed a revival since quietly remerging in 2014 thanks to a series of eye-catching colourways and collaborations; most notably, that memorable one with Supreme back in 2016. Developing the already futuristic VaporMax, the VaporMax 2019 reworks its forerunner’s upper with a new Nexkin fabric. This translucent stretch-woven material contours to your foot seamlessly, delivering enhanced comfort, durability and breathability up top. There’s also a nifty new internal cage which wraps around the midfoot for locked-in support, while a TPU coating provides the Air bag with a colour-shifting aesthetic. However, one thing remains: the revolutionary bubble outsole is positioned underfoot for cloud-like cushioning with each step you take. Introducing the Air Max 720: Nike’s all-new silhouette arrives with their most protective and durable cushioning platform to date - boasting a foot-cradling 360-degree midsole that houses the brand's tallest ever heel bag: standing at an unprecedented 38mm. Up top, colour-shifting knitted uppers take inspiration from a selection of the earth’s natural wonders. The 720 is also the brand’s most sustainable project to date: comprised from up to 80% recycled content. 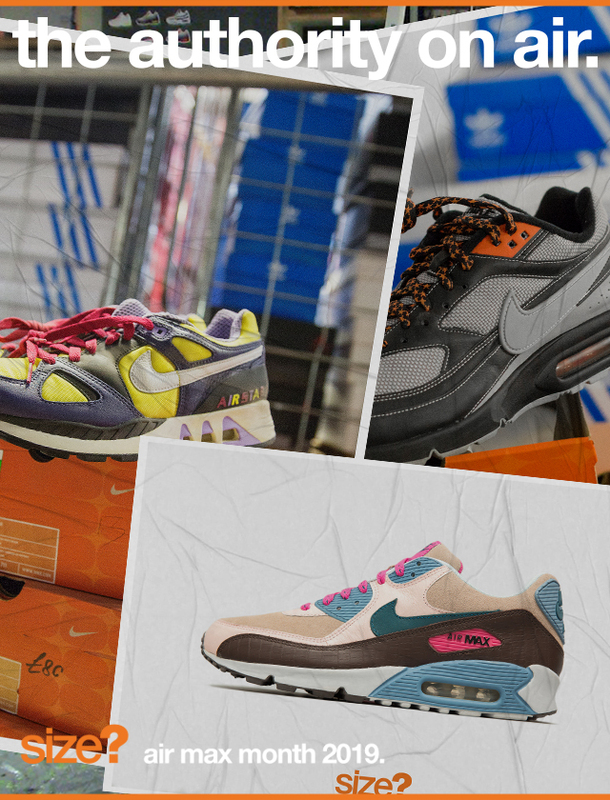 In the lead up to Air Max Day 2019, we’ve dug into our back catalogue of exclusive releases, dating back to 2005, to retell some of our favourite stories from over the years. 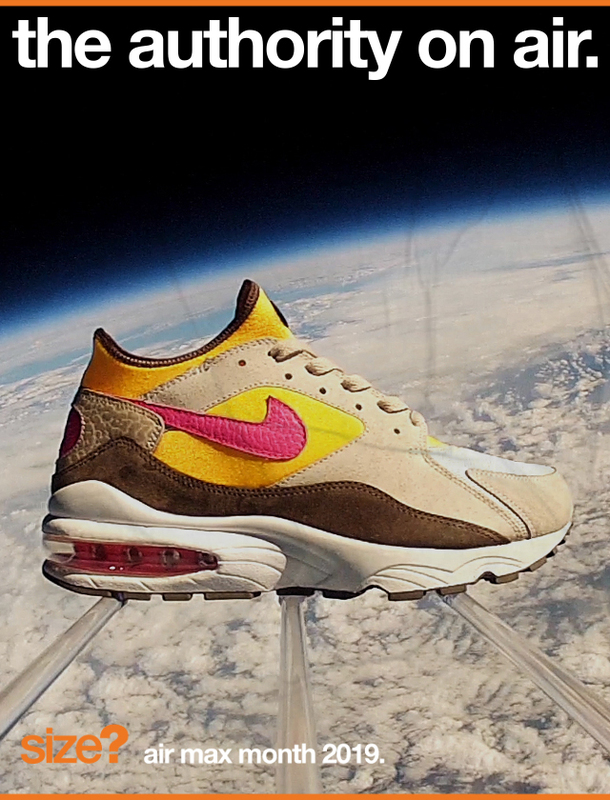 Projects range from our collaborative partnership with artist Dave White, reissues of long forgotten OG silhouettes, and even launching a shoe up into the stratosphere. 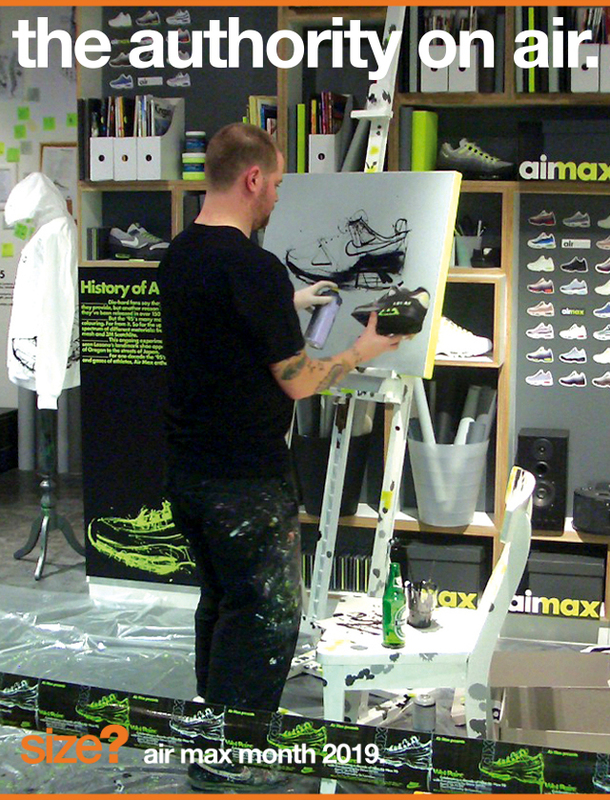 Every day of the month we’ll be retrospectively looking back at our past, and sharing behind-the-scenes information about the inspiration behind colourways, all hosted on our ‘Authority on Air’ page.